Super Hero Boy: The ultimate christmas wish list.. The ultimate christmas wish list.. I've been thinking as the holidays approach if I really was Santa and I could get Connor anything I wanted for Christmas what would I get? I'm sure we will revisit my ultimate wish list as it gets closer to Christmas but I just had to share with you the company that is responsible for a large amount of the items I would just love to have. I've loved horses from as long as I can remember and the earliest toys I remember loving were my rocking horse and a set of porcelain horses of my mom's which I ended up breaking, and still feel horrible about sorry Mom! Though I won't be able to afford to buy Connor his first real pony for quite some time I knew immediately that he had to have a rocking horse no matter what. The problem is my house is not terribly large and a rocking horse is usually a fairly large item. I just couldn't imagine having a huge cartoon looking plastic rocking horse in my living room so any potential horses have to look as good as they are fun. The new Arabian from Plan Toys is just what I've been looking for! Simple in design it will not overwhelm my living room but with a hint of color its not boring either. The best part though is the price, not only is it one of my favorite items from their large scale line it's also the cheapest! 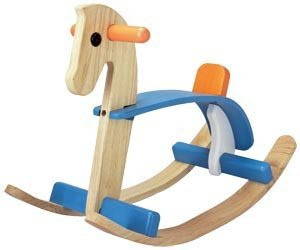 Don't let the price fool you though as with every plan toy I have gotten my hands on its incredibly well built, easy to put together, and with a little care you will have a little rocking horse that your own kids can give to their kids. Unlike a plastic toy you can always take it apart and store it almost flat between children as well, but I'll bet you wont want to as its just really too pretty to store under a bed somewhere. While I was over at Plan Toys drooling over the rocking horses I spotted something that I knew we just had to have. When I met Connor's daddy he was working as a forklift driver which is a pretty fun little vehicle but have you ever actually seen a toy forklift? 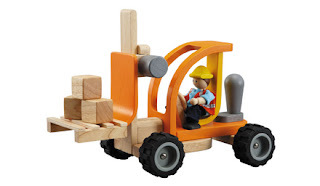 Plan Toy's activity line is a medium sized wooden vehicle line. From school buses to motor homes its designed with boys and girls in mind. Scaled perfectly for toddler's hands they are fabulous to play with all on their own but they perfectly match the Plan Dollhouse toys as well. The forklift in particular is sized perfectly to move your blocks from one side of the living room to the other. It comes with its own little driver but the real driver is your child! Complete with a little knob on the back which is perfect for little hands to steer it left and right its addictive fun to move the blocks around. The best part is, its really fun, and there are no batteries required! Go check out Plan Toys and browse through their entire selection of toys. I think you will be as tempted as I am to add a few of them to your own Christmas wish list! Plan Toys is a green company as well, all of their toys are made in an ecofriendly plant with earth friendly materials! You can really feel good about that.